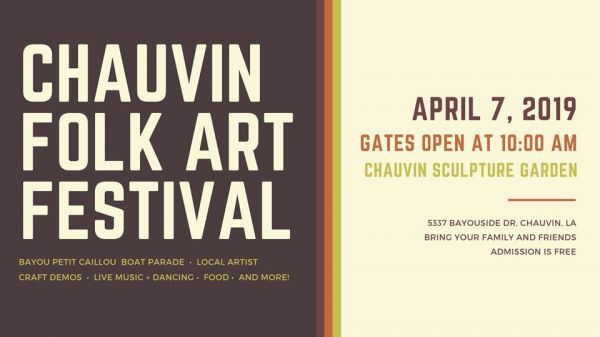 The Friends of the Chauvin Sculpture Garden will present Chauvin Folk Art Festival, taking place at the Chauvin Sculpture Garden + Nicholls State University Art Studio, 5337 Bayouside Drive Chauvin, Louisiana 70344 on Sunday, April 7, 2019, from 10 am – 4 pm and featuring music by Waylon Thibodeaux and Nonc Nu and the Wild Matous. The Friends of the Chauvin Sculpture Garden is proud to bring Chauvin Folk Art Festival to Chauvin, LA on the banks of Bayou Petit Caillou. Chauvin Folk Art Festival is a great place to view the boat parade and meet the local artist.